 How did African Americans experience it?  What is the difference between segregation and separation?  What are the consequences of segregation? Separation? 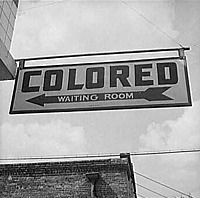 Image: "Colored waiting room," sign at Greyhound bus station, Rome, Georgia, September 1943. Courtesy of the Library of Congress, Prints & Photographs Division.